A Devic Crystal is a crystal with multiple internal fractures and inclusions of trapped water, air and gases. Devic Crystals can be any shape, variety of quartz crystal, formation, or size and do not have to have perfect terminations or even any termination at all. 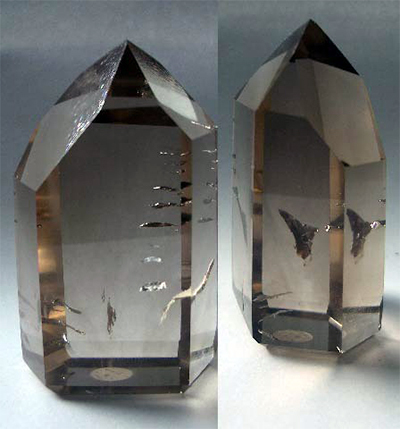 The trapped water, air or gas within your Devic Crystal is often called veils and fairy frost. It was once widely believed that fairies and other nature spirits stayed in these crystals as they traveled from one place to another, turning a Devic Crystal at one level into a kind of vessel for nature spirits. A Devic Crystal helps you to become more open to the possibility that Earth does indeed have "nature spirits". Once you have proven that you can be trusted to be a caretaker of this planet and its life forms, these protectors of Earth may communicate with you though your Devic Crystal. If you earn the trust of these energies, they will teach you a great deal about the true nature of this planet and its function in our Universe. And if you are very, very good they might even take you to visit the inner realms of planet Earth, or the kingdoms behind the mists. Devas themselves are light beings assigned to planet Earth to assist her various life forms and energies. Throughout human history, Devas have been elves, fairies, and other nature spirits, although Devas in the oldest existing legends were believed to be what we now call angels. The Sanskrit root word Devi itself translates as goddess. 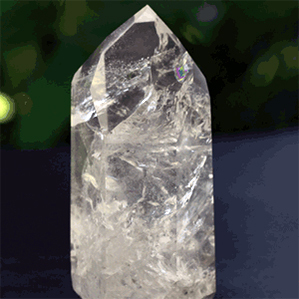 So your Devic Crystal is a reminder of your own supra-normal powers of consciousness and your natural ability to reconnect with "beings of light". This crystal is a wonderful gift for any newborn since Devas and fairies like to bring extraordinary and miraculous gifts to infants. And Devic Crystals are, or course, great for plants of all kinds. One of the best tools for communicating with "the little people"
Devic Temple crystals can be the temporary vehicles through which spiritual guides can find expression and offer wisdom, insight and blessings into our lives. The inner inclusions display impressions of other worlds, temples, or most importantly, faces or outlines of beings inside the crystal. These crystals enable higher beings on the inner planes to connect with the material world and for human beings to contact the angels. They symbolize inner sanctums of the self where one can find the peace and inner reflection and where communication with the self can occur. The purpose of working with these crystals is to receive higher guidance and direction that will assist you to go within and become more aware of your true identity and more connected to your own source. Devic Temples are special crystals that have possibly the strongest Life Force of any crystal. A Devic Temple is an Earth Spirit Stone. The shelves and ledges within the stone serve as resting places for higher order light beings. 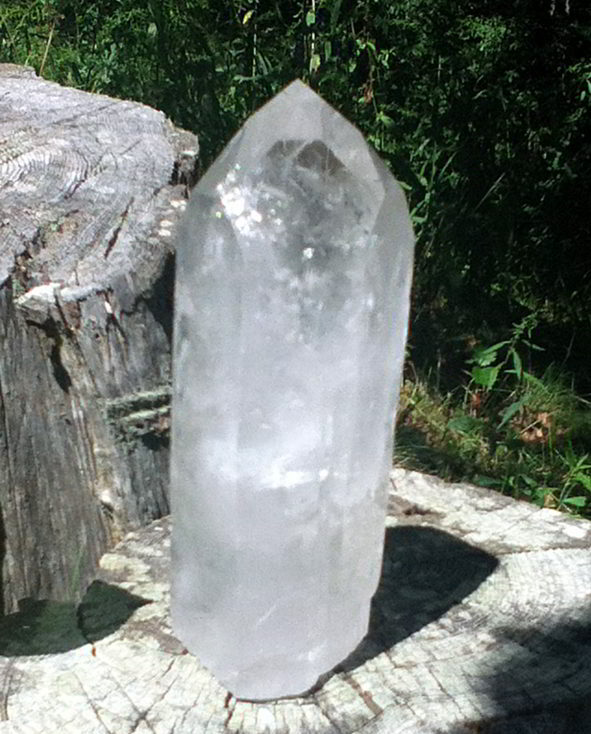 The Life Force of the Planet Earth is stronger in these crystals than in most because of their resident Earth Spirits. Each Devic Temple is source of great wonder, but few people take the time or energy to appreciate even one Devic Temple crystal. These are crystals that are usually fairly inert indoors, or outside in busy, noisy environments. If you seek the wisdom of the Planet Earth, and wish to understand her needs, and her gifts, use a Devic Temple mediation stone in a natural, peaceful setting. Devic Temples are reported to be Master Crystals that provide a gateway through which Angel and other spirits can enter the physical plane." Inside the crystal are rainbow inclusions of trapped air, water and gas that are called veils, foils and fairy frost. The crystal's external formation can also remind us of a temple with stairways and doorways. These crystal forms attract the higher dimensional beings of light who remind us of our own "extrasensory" powers of consciousness and our natural ability to connect with them. The harmonic vibration of these quartz allows the veils between the worlds to be lifted and spiritual energies can infiltrate into the surrounding environment." Devic Temples are crystals with internal fracture planes that appear to be horizontal ledges and shelves when the crystal is held vertically. Do not confuse with Fairy Frost Crystals. Devic Crystals are very rare crystals. They are many times called Fairy Crystals. The fairies presence is often felt among the stone beings and they create FUN! If your intention is to work with the Faery Realm, remember one important rule – never break a promise made in that magical, sacred land!